Facebook launched Reactions and Facebook Live video to all users, and doubled down on Messenger. Instagram expanded video lengths to four times their previous length and implemented an algorithmic news feed to show top content first. Twitter changed their Home feed, introduced GIF search, and just announced updates to the 140 character limit. Snapchat rolled out Chat 2.0 and opened up geofilters. In a recent webinar with Mention, I addressed the interruption of platform changes and identified four digital trends for marketers to get out in front of now. (Watch the replay here.) 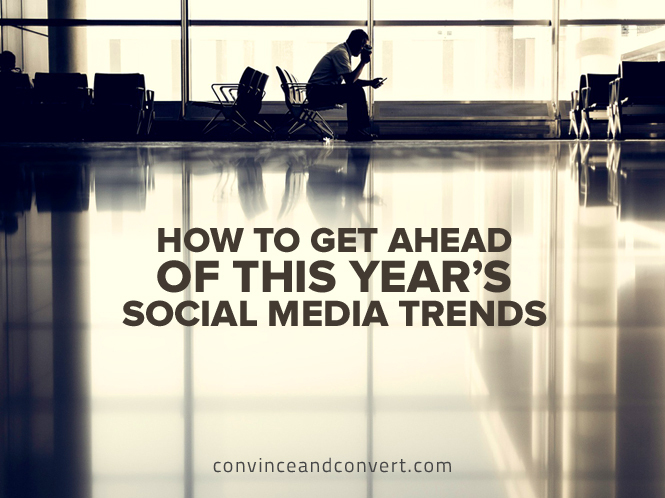 These aren’t the only changes happening in the ever-evolving social media industry, but if you need help choosing how to position your brand and your content for success, it’s a good place to start. Imagine if you were to be invited to a friend’s house for dinner. Upon your arrival, you immediately tell your host that you have a casserole cooking in your oven, and they should come with you instead to your home, to eat your dinner and get the recipe too. That wouldn’t go over well, neither with your host nor the other guests. The more you do this, the fewer invitations you’re likely to receive. So why do brands insist on treating their audience in social media the same way? Too many brands (and people!) think of social media as a way to redirect the audience back to their own website, instead of joining them in that channel. To be a good guest, begin creating content that fits organically within the social media channel. Use each social channel’s unique characteristics to inspire creativity, rather than perceive them as limitations. Create content that adds value, not noise. While fresh content should live on your domain for SEO and conversion purposes, recognize that sending users to your website is not always necessary. Join the party—don’t always insist on being the host. Content comes in many forms. Even so, there are three specific keys for producing content that gets noticed and earns engagement. Video is here to stay. Horizontal or vertical. Long form or quick hits. Consumed live on a mobile device or in a virtual reality environment. Audiences vote with their time, and they’re increasingly spending time watching video online. In fact, Cisco predicts mobile video will make up the three-fourths of all the world’s internet traffic by 2020. Your content strategy should include video in all forms, with the intent of allowing your audiences to consume it natively in whatever channel they interact with your brand. Audio is underutilized as a medium for marketers, even though audiences increasingly consume audio content. The same number of people listen to podcasts today as use Twitter. Get started by seeking out opportunities to join podcasts as an interview guest or co-host. When you are ready to launch a podcast, this guide can point the way. If music is more natural for you or your brand, follow the example of Hamburger Helper, and leverage music streaming services as a key community to participate with. Don’t limit your emoji to text messages. Those ever-lovable pictographs are increasingly part of everyday communication, so much so that the “face with tears of joy” emoji was named the 2015 Word of the Year by Oxford Dictionary. Whether in display advertising or email subject lines, brands are getting comfortable using emoji in marketing messages. Twitter has jumped in with custom Twitter Emoji for historical moments, sports and entertainment events, and elections (and has made them for sale too). If none of the 1,281 characters in Unicode 8.0 fit your needs, than go the way of IKEA and Kim Kardashian, who have both released their own custom emoji keyboards. Facebook is commonly blamed as the primary culprit for declining organic reach, but the truth is that each of the primary social networks have moved to an algorithmic feed in an attempt to serve up the most relevant content to each individual user. Rumors are that Snapchat will soon follow suit within their Stories and Discovery modules. Now that total followers is a vanity metric and not an indication of views or engagement, what options are left to ensure content reaches the masses? Social marketers can respond by honing in on intended audiences through organic and paid targeting options. It’s time to include “audience“ in the content planning process, alongside intended channel, post type, and time/date to publish. With your paid social budgets, take advantage of the retargeting functionality offered by Facebook and Twitter advertising platforms to continue to reach an audience who has already indicated their interest by visiting your website or downloading gated content. Create unique content specifically for these audiences who are already midway down your marketing funnel. Who your audience trusts has changed. It’s extremely important to understand the role of influence and who truly wields power of influence over your audience. Most likely, your brand and your CEO, or even a paid celebrity spokesperson, are not trusted to the degree of a “person like yourself.” Influencers can help bridge that trust gap with your social audience. Strong influencer campaigns can result in changing perceptions and reaching new audiences. Working with influencers can be daunting at first. Be prepared to give up control of the message and medium, but do so with trust in the influencers you hire. Outline your own expectations and goals before launching a campaign, but also be sure to understand what outcomes the influencer expects. Offer access to restricted or one-of-a kind experiences, but don’t forget that for many influencers, their online brand is a financial venture. Be prepared to compensate them fairly for their time and effort. An influencer’s priority is to their audience first, and keeping their message authentic is the key to their (and ultimately your) success. There is no crystal ball in our industry—no way to guarantee the plans we put forth today will result in the outcomes we predict. Every social marketer or community manager understands this nuance and (mostly) embraces it. By reading this post and watching the webinar replay, you’ve already set yourself apart by staying one step ahead of the masses.